Maré at Pine Cliffs is located on the welcoming sands of Praia da Falésia Beach, arguably one of the most secluded beaches in the Algarve. 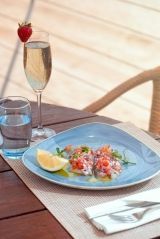 Days of playful fun in the sun are uninterrupted with beach service including light snacks, delicious salads and refreshing beverages. Children and adults alike will love our selection of delightful ice creams, too. During the summer months, the Maré showcases live entertainment on selected evenings, a dreamy venue with the stunning cliffs of the Algarvian coast providing a stunning stage backdrop. 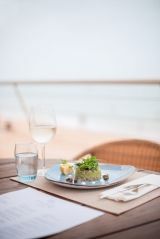 At the hands of Stuart Sage, Executive Chef at Pine Cliffs, A Luxury Collection Resort, the beach club & restaurant Maré at Pine Cliffs has a menu that uniquely unites the freshness of a healthy salad with the delight of fresh fish by the sea. 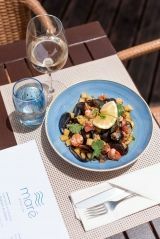 Spoil yourself with a salad of grilled squid accompanied by fresh vegetables and lemon vinaigrette, opt for a ceviche with Algarve salad or other delicious dishes while you spend an unforgettable time at one of Portugal's most beautiful beaches.